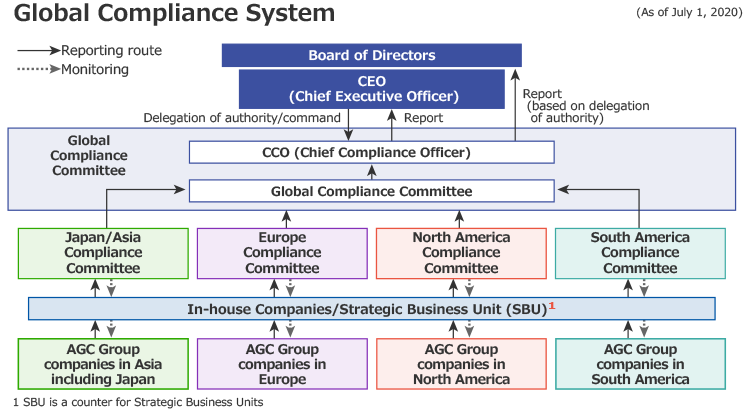 The AGC Group has placed Global Compliance Officer (CCO) as principal entity responsible for development of the compliance organization and promotion of compliance. Under CCO, Global Compliance Leader and regional compliance committees have been established. These committees design and implement compliance programs, and monitor their status in each respective region. Reports on group-wide policies and their status are also regularly given to the Board of Directors of AGC. Additionally, in accordance with compliance reporting system guidelines, serious compliance violations are promptly reported to top management. Compliance is the fundamental premise underlying the Group's business activities. To that end, The AGC Group Code of Conduct sets forth requirements for all employees in the workplace. The code comprises global requirements of business conduct for all employees to follow regardless of country or region, as well as regional supplements that take into account the differing laws and business customs of respective countries and regions and include items to supplement the global requirements. 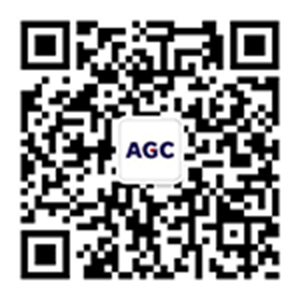 By the end of June 2018, 13 editions of the AGC Group Code of Conduct had been issued in 19 languages. The AGC Group has established several varieties of help lines to serve as consultation desks regarding the Code of Conduct. As a general rule, help lines are set up at each company, while additional area-wide help lines are established in Europe, North America, and Asia. In Japan, employees can contact external lawyers. To encourage employees to use the help lines, the Group protects the anonymity of consultants and strictly forbids any act of retaliation against anyone who makes a report in good faith. When consultants offer their real names, efforts are made to facilitate effective two-way communication and provide feedback on the status and results of handling reported issues. For the purpose of providing help line contact information, help line numbers are listed in the AGC Group Code of Conduct distributed to all employees. They are also publicized in each country and region through efforts such as placing posters at each site. AGC and its group companies recognize that proper tax payments impact the economic and social development of each country, and that ensuring proper tax payments is one of the company's Corporate Social Responsibilities. The AGC Group has therefore set its basic stance on taxation in the Group's tax compliance policy.